Pixel an scene that includes something made out of glass. Optional bonus challenge: include curved glass in your scene. Thanks so much to all who took the time to vote and participate in the challenge! Check out the Parallax Window forum thread for more information. 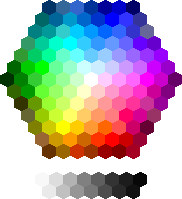 It's time to vote for the latest pixel art challenge: Not-Particularly-Big-Soft. Thanks so much to all who took the time to vote and participate in the challenge! Check out the The Easter Notbunny forum thread for more information. It's time to vote for the latest pixel art challenge: Parallax Window. This week we want you to pick a maximum of 12 colours from the Microsoft Office palette (shown below) to depict something small. It could be toy car, bacteria, a chihuahua etc... just as long as it's something that could reasonably be considered small in comparison to an average-sized human. Canvas Size - Max 192 (width) x 96 (height). A little game developed with Unity in 36 hours for the Edge Create Challenge by Misbug, Piero "w4nderlust" Molino and Giovanni "Carnefrisca" Colì. Even though the engine doesn't actually support pixel art illustrations, the game has been based on 2D pixel art sprites. The project is still on and maybe in a near future you'll find a version for touch screen devices. The following pixel artists produced Pixel Joint's top rated pixel art for March 2012. Many thanks go out to this month's top pixel artists and all the members who took time to rate. The Itsy Bitsy Spider... by The B.O.B. The Pixel Art Guild interview Simon Anderson (or Snake as he's known here on Pixel Joint) about his experiences with pixel art and game development. The interview touches on the origins of Simon's art, how he got into the gaming industry, and his current project Owlboy. Challenge Awards: Oh My, God-Rays! Thanks so much to all who took the time to vote and participate in the challenge! Check out the Oh My, God-Rays! forum thread for more information. It's time to vote for the latest pixel art challenge: The Easter Notbunny. Gecimen challenges you to create a 100 x 100 animation that clearly depicts a parallax scrolling background. The image should consist of at least two layers moving at different speeds to be considered as parallax. Optional bonus challenge: Add a moving unit (vehicle, infantry etc.) in the foreground. Animation - Required; max 30 frames. Vertex is an action exploration platformer game developed by PJer iMoose (or BENJAMUS) in which the player controls two characters in the province of Halcyon in order to fight the unknown force behind the sudden attack on the Vertex. A very cute and fun game found on Kongregate. Play it HERE! Thanks so much to all who took the time to vote and participate in the challenge! Check out the April Featured Gallery forum thread for more information. Challenge Voting: Oh My, God-Rays! It's time to vote for the latest pixel art challenge: Oh My, God-Rays!. Pick a real life animal - other than a bunny (or any other lagomorph) - and depict them with a basket containing Easter eggs. So, for example, you could show an 'Easter Dolphin' delivering eggs to scuba divers. Test your sprite in a game? Want to test how your sprite would fit in a platformer? Check THIS out. Use the box at the bottom to you paste the url to your sprite. (GIF with transparent background with character looking left is best). It's time to vote for the latest pixel art challenge: April Featured Gallery. Pixel Art Challenge: Oh My, God-Rays! Create a scene showing crepuscular rays. Thanks so much to all who took the time to vote and participate in the challenge! Check out the Green With Envy forum thread for more information. Good News: PJ is Getting a New Login System! As you may be aware, we've been having server issues recently. In order to help prevent such issues in the future, Pixel Joint has decided to phase out the current login system in favour of the more robust Facebook® login system. Thankfully, this exciting upgrade will take place as soon as possible. Hopefully by the end of next week the ugly old system will be long gone, and users will only be able to login via the world's #1 social network. Hooray! Note: We are well aware that not everyone uses Facebook®; therefore we do have a solution for those without a Facebook® account. Please read on for instructions. Update: Just to clarify for those that didn't catch on; this is an April Fools joke and we have no plans to change the login system.